This is just bile, so you may want to move on — move along, move along, says the mental policeman, nothing to be seen here that isn’t seen every other day. But if you want to stick with me for a moment, nothing I am about to say will surprise you. In Britain, the Tories have decided today that the roads of the country should be sold off. There isn’t enough money to repair them, but there’s enough money for a commercial company to take profits out of them. Yes, you work that one out. And while you’re doing it, spare a thought for Nicholas Hoare, one of civilization’s beacons. He owned three bookshops in Canada — OK, so it’s not a cure for cancer, nor did he discover life on Mars. But he created three points where people who wanted to think, to reflect, could come together; where people could explore more than their own small worlds. In effect, he created three small spots of mutual respect and decency. This is not a story of changing reading habits, or the velociraptor that is Amazon. This is a much sadder, and more brutal story. Two of the three shops, faced with rent hikes of 72%, will now be forced to close. And who is this rapacious landlord? Well, it’s the government, the National Capital Commission, the crown corporation that ‘looks after’ (I use the inverted commas advisedly) federally owned land. And the government is permitting — probably egging on — these shocking price hikes. Nothing to do with us, guv, their spokesman says. We can’t help it, can we, if the land has become more valuable. No discussion, no mediation, just pay up or piss off. We don’t care what kind of shop you have — we can probably get a fast-food place in there, or maybe even that holy grail, a mobile-phone shop. Then we’ll be laughing. I have, here, nothing clever, nothing funny to say. Just shame on you, Canadian government. Shame on you, NCC. I hope, when you go home after a long day closing down businesses that people value more than in just dollars and cents, when you go home at night, and your children want you to read them a story, you spare a thought for Nicholas Hoare. Why? The question really needs to be asked. Why all the hoopla, the adaptations, reprints, books, comics, tweets, no doubt Facebook pages too. Did we do this for Thackeray last year? Will we do it for Wilkie Collins? Or even George Eliot? A deafening silence brings the answer. 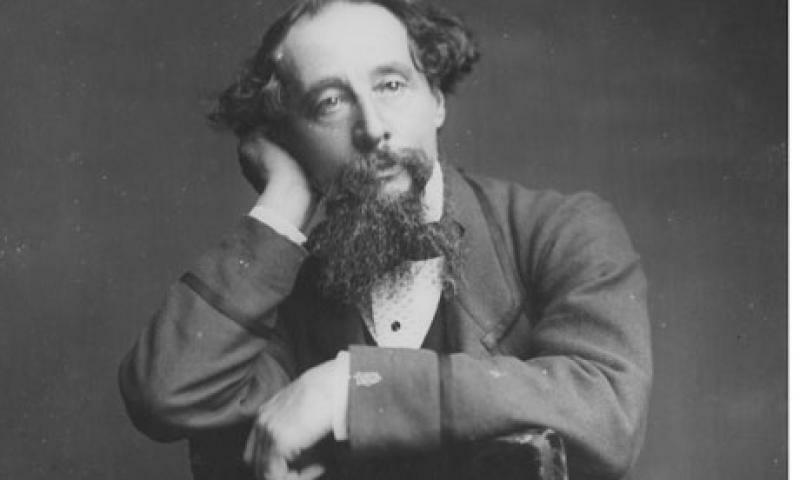 Dickens is, as he so facetiously named himself, The Inimitable. And today, at Westminster Abbey, it was clear how much he mattered to how many. Of course there were the professionals there: the descendants, the museum curators, and those who write about him (myself included in that group). But there were lots to whom Dickens just matters, and this was the focus of the ceremony. Claire Tomalin, whose biography of Dickens appeared a few months ago, read a letter that demonstrated his gaiety of spirits (and possibly more, but she spoke very quickly and, with the difficult acoustics, she was hard to hear). But then most of the rest of the occasion was taken up with Dickens and his attitudes to the society around him, the Dickens who was outraged by the rich’s denigration of the poor, their refusal to accept what was in front of their noses: that the poor were not poor because they were idle, or feckless, or lazy, or weak; they were poor because the rich were rich. And that is what Rowan Williams, the Archbishop of Canterbury, too, focused on: that the 21st century is becoming as unequal as the 19th, and as long as we fail to turn inwards, to accept that we too have a responsibility to a better society, then we are failing to read Dickens correctly. It is the Dickens of outrage, the man who rejected well-fed, well-to-do complacency, that was being remembered. Women’s reads, or reading women? One for the sisterhood. A complaint to W. H. Smith has brought about a change to the way some books are labelled. Books by and for women – ‘Women’s fiction’ – will no longer be labelled as such. Books by and for women, in W. H. Smith, are now, ahem, ‘fiction’. This separation, this discrimination and ghetto-ization, of course, originally came from good intentions – it was, as the US military would say, ‘blowback’, the law of unintended consequences. Women were being squeezed out of the market, with books by men predominating. So ‘women’s fiction’ shelves were created. But did that mean that Charlotte Brontë and Mary Shelley, or even Joan Didion and Anne Patchett, were moved there? No, the first two went to ‘Classics’, the second to ‘literature’, or even ‘poetry’. Toni Morrison to ‘Fiction by women of colour’. Others went to ‘Gender studies’. Until, finally, of course, ‘Fiction’ was entirely inhabited by white males (usually heterosexual: don’t forget ‘Gay fiction’). And ‘Women’s fiction’ had pink covers, lots of gold embossing and the odd picture of a pair of shoes. Women write more books, women read more books, they make up the audiences at readings by possibly as much as 10 to 1. But they get less space: physical, in the bookstores, and mental, in reviews, both as reviewers and reviewed, and I suspect from a quick look (subtext: don’t hold me to this one, please), many literary festivals. W. H. Smith has taken a step towards, if not giving them more space, at least removing them from a tokenist shelving ghetto.